Friday I’m In Love: New Series! Welcome to my new series: Friday I’m in Love! As you may know, I’m obsessed all things pop culture and I thought a place to share what I’m loving right now would be perfect for the new site. At least once a month, I’ll update you on what is my favorite. Feel free to comment with what YOU love also–I’m all about finding new obsessions! Undisclosed: a bi-weekly follow-up to the popular Serial podcast. SO addicting and if you’re into true-crime, you’ll love it! Beyond Your Blog– tips for writing on OTHER sites, what they’re looking for and how much they pay! Also late with jumping on this bandwagon, mostly because I thought it was for rebellious teenagers. Ha! Little did I know, it is ADDICTING. If you’re on, be sure to check out my story line (CheapAsh) where I share my dinner recipes and other household chaos. Who Do You Love by Jennifer Weiner. I absolutely love her books, but this one was different than most. In a great way. This book spans decades telling the story of Andy and Rachel. It’s not your traditional love story and there are quite a few twists and turns. Eight Hundred Grapes by Laura Dave. Did you know it takes 800 grapes to make a bottle of wine? This book is a definitely a girly read, but the story keeps you interested. As Georgia’s story unravels in wine country California, you’ll want to pick up a bottle of your own to sip while reading this. Why Not Me by Mindy Kaling. I loved her other book and she is my pop-culture spirit child. Her persona on her show is so much like me, it’s scary sometimes. Can’t wait to dive into this over the weekend. A Window Opens by Elisabeth Egan. I’ve been reading this sporatically for a few weeks now and it’s kind of a slow start, but the story is interesting. Alice is striving to have it all, with a flashy new job and 3 kids at home. I’ll keep you posted…. To say I am a TV addict would be an understatement, but with limited time lately, shows have to REALLY be worth it! Here are my Top 5 shows of the moment. Yes, I still watch my fair share of Bravo, but you already know about Housewives! I love to laugh and (heads up), most shows I’m recommending have some language in them–not for little ones. I am also catching up on Scandal, but I won’t be watching this new season until probably December (ear muffs!). Difficult People (Hulu). This show is about two people you should probably hate, but totally begin to love. It’s hilarious and you never know what will happen next. Last Man on Earth (Netflix, Fox). We are still on Season 1, but I am surprised how much I love this show. Will Forte is great and this show is very funny. 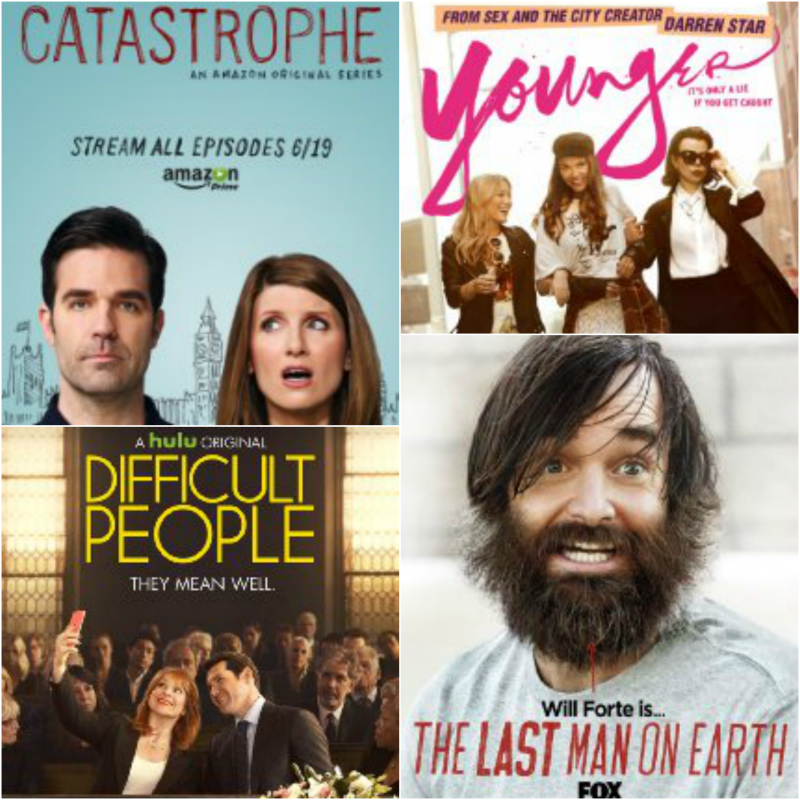 Catastrophe (Amazon Prime). To sum it up: an unexpected pregnancy meets British humor. Younger. A 40-something posing as a 20-something millennial could be a disaster, but it’s actually a great show! Season 2 starts early next year. I really love Hillary Duff in this role. 36 Hours. Kristen Kish (from Top Chef and right here in GR!) and Kyle Martino travel around the world, visiting locations for 36 hours. The food they eat looks amazing and I love to see a different travel perspective. What are YOU loving right now? Should I continue this series?